25 October – Meeting with Minister of Education, H.E. Mr. Teerakiat Jareonsettasin regarding the development of Vocational Education and Training for Thailand. 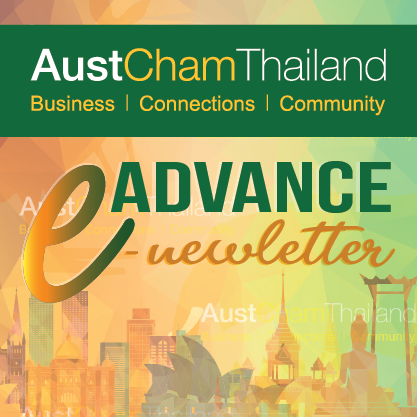 On Wednesday 17 October, AustCham Thailand, in collaboration with partner chambers, held AustCham Joint Business Luncheon on “Update on the Development of the Digital Economy” at Grand Hyatt Erawan Bangkok. In this regard, we would like to express our sincere thanks and appreciation to H.E. Dr. Pichet Durongkaveroj, Minister of Digital Economy and Society, for taking his time to become our special guest speaker and, importantly, for sharing valuable information on Thai government’s progress on the Digital Economy development. On Wednesday 3rd October, AustCham Thailand held its monthly business networking, October Sundowners, at Park Hyatt Bangkok. Prior to the event, there was also AustCham’s Digital Workshop Series Launch took place at the Penthouse Cocktail Bars whereby trainers from various digital company members, i.e. Dot360 Agency, Lexicon Business Communications, Mad Appe Development, Primal and Weber Shandwick Thailand, outlined the workshop objectives, expectations, and content, as well as acquiring members needs and opinions on this matter to be able to tailor the courses accordingly. Thanks to them for generously offering their time on this and we can’t wait for an upcoming official Digital Workshop! Finally, we would like to thank our venue sponsor, Park Hyatt Bangkok, for making these events successful.